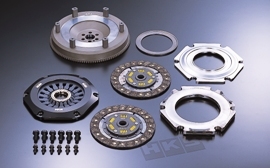 HKS’ clutch series are clutches for sports driving. It was designed to improve shift feeling, pedal pressure, and characteristics appear when the clutch is half engaged. New material “MG Composite Disc” was utilized for ease of use and high torque transfer. Single Plate type requires light pedal pressure like a stock clutch, but it can support approximately 450PS. 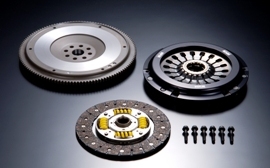 Twin Plate type has similar characteristics to a stock clutch when the clutch is half engage, but it can support approximately 700PS. Also, it has improved clutch engagement ability and comfortable operability; both are much superior to conventional metal materials. 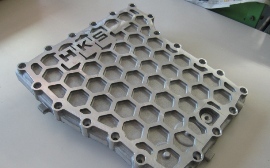 This twin plate type is recommended for street driving and occasional circuit driving.